Well this month definitely went by fast. I had good intentions to get a couple blog post in before now but things just didn't work out that way. My maternal grandfather passed away on July 4th. The visitation and funeral were over the 8th and 9th in Battle Creek. It is always nice to see family and friends that you have not seen in quite some time, its just too bad it only happens when someone dies. I did get a chance to put together this quilt block. It will be part of the main raffle quilt for my guilds quilt show in October of 2014. I have made good progress on it. 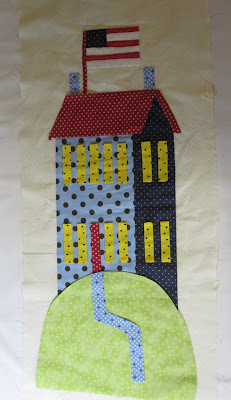 I have just the 13 windows to stitch down, which I will be working on Tuesday night at our guilds annual fun night.